But as a whole, this team was more than just painful, they were embarrassing. At a time when the Braves faced must-win games at home, when they had to show their mettle, they were outscored 27-9 over six games. They were shutout twice. They scored in just 4 innings out of 53. 4 out of 53! They managed just 3 ER off 6 starting pitchers. In all my years of watching baseball, I’ve never seen anything like it. This was beyond collapse. Something has to be standing up to collapse. This team seemed as though they never got off the bench. I need to qualify that statement. Our pitchers need to sue the rest of the team for non-support. We have a lineup full of dead-beat-batters. Our starters have notched a league leading 108 quality starts through game 156 to date this season. The segment that should have an excuse, that was truly decimated before pitch 1 of game 1, leads MLB in quality starts. Yet, the Braves are heading toward a sub-.500 team for only the 3rd time since 1990. Things change over time, and sometimes change quickly. Two weeks ago, I advocated for Frank to be given one more shot to correct his mistakes. As recently as a few days ago, I half-heartedly stood up for Fredi in that he has been dealt a rotten hand. But the series against the Mets revealed more than just the obvious flaws we’ve discussed ad nauseum. Frank assembled a team that lacks certain necessary game elements to be effective, and he allowed the team’s leaders to leave at the same time. His inability to get along with other staff directly led to long-time and highly respected scout Dom Chiti and coveted pitching instructor Dave Wallace leaving for other teams. And it was revealed over the weekend that John Schuerholz is the one that stepped in to the breach and prevented Roger McDowell from departing to the Phillies. This team lost several strong planks and attempted to replace them with Popsicle sticks. The boat is sinking, fellas. As for Fredi, yes he was dealt a rotten hand. But he looked totally lost and defeated over this last week as well. He appeared to be grasping at straws. And while he did seem to manage his pitchers better this year, his mis-handling of Even Gattis is just unforgivable to me. And let’s not forget this is the 2nd September in the last 3 that the Braves looked like they were making vacation reservations early. No, there is much work to be done both on and off the field. We have 2 years left before we open a brand new ballpark and a new era for the team. There is no way that Terry McGuirk and John Schuerholz are going to let this bunch pave the way. This is the offseason for the foundation to be laid. Frank is and Fredi should be gone, along with Walker/Fletcher and Tosca, and likely Dascenzo. I still believe TP and EP should be safe, given their long term ties to the championship days of this team. At least John Schuerholz finally did what had to be done and canned Wren and his right hand man Burse Manno more changes are likely. My money is on John Coppolella, but with the appointment of John Hart as interim GM and the announcement of a blue ribbon search committee consisting of Schuerholtz, Hart and surprisingly Bobby Cox, anything is possible. That said, the new guy will get started with evaluating the team top to bottom. I would have liked to see TP lead the last 7 games to see what he’s got. I’d would be nice to see if he could rally the troops and get this team to show some pride before heading to the beach or the golf course or the woods. However, perhaps his recent back trouble precluded that. That and Bobby Cox’s support of Fredi Gonzalez. For better or worse, Bobby still appears to be willing to take a bullet for his guy. As far as any great hope for 2014, it walked out the door yesterday. The push for 2015 should started today. Jefferson, GA (i.e. God’s country) – Yeah, I know we’re in the middle of an exciting and tight pennant race here in 2010, but I have 2011 on my mind. It’s coming whether we have a Championship season or not. #1: Is there any covert agreement in place with Fredi, or are the reports true in that the Braves have given him no indication at all that he’s a candidate to manage here next season? Is Fredi really even the best candidate to replace Bobby? If not, who is? What about the current coaches? Clean house, or keep some/all? Who? #4: This really isn’t a question, more of an assertion. Frank has to fix CF. Ankiel is a nice defensive guy, but not a starter for a contender. Melky is not an option (maybe a non-tender option, but not a starting option) and Schafer has a long, long road back. This may be Frank’s toughest offseason job next to hiring a manager (which ought to be easier than it appears.) Who’s available? #7: And what of KK? He won’t be in the 2011 rotation plans, so can he be traded? I think he really needs to pitch well for us in the next 4 weeks to redeem his value. He only has one year left on his deal, and it isn’t terribly unreasonable in the current inflated salary environment. Did I mention that he really needs to pitch well over the next few weeks? #8: Who closes? Kimbrell? He was the heir apparent early in the season. That is until Venters came from nowhere and impressed everyone, including current door-slammer Wagsy. Wags says Venters has the best stuff on the staff. The whole staff. That’s some pretty stout words. Bobby has never felt really comfortable handing closer duties over to a youngster, but then again Bobby won’t be here, will he? Heyward for 2010, and now Freeman seemingly taking over at 1B in 2011. So, who is the next one to watch? Is it just one, or the troika (first on blog?) of Aroydis Vizcaino, Julio Teheran and Randall Delgado? We know they’re coming, and we’re all licking our chops over this new wave of talented tossers. But what about position players? Maybe it’s young SS prospect Matt Lipka. You remember him, right? This year’s top pick… speedster… He had a stellar rookie season in the GCL, and was rewarded with a post-GCL promotion to Danville for their playoff run. He finished his inaugural pro campaign with a slash line of .296/.353/.392 with 34 R, 8 2B, 4 3B, 1 HR, 24 RBI, 22 K, 21/24 SB. You see the last part? 21 steals in 24 attempts. Also, notice he had only 22 K’s in almost 200 AB’s. He’s a few years away, but he looks like a good’un for sure. I’ll be keeping my eyes on him. Did I mention 21 out of 24? Comments and articles herein are the intellectual property and opinions of the writers and may not be copied without permission of the writers. Editor’s Note: Found this photo and just had to insert it for old times’ sake. Were they truly that young?? Watched the first two innings last night. A pretty exciting evening it was, but not because of the listless, hapless Braves. About the time the Braves game was called, a powerful storm rolled into Savannah like a freight train with massive lightning, driving pea-sized hail, rain, water spouts and micro-bursts. Pretty exciting stuff. Not so much the Braves. It’s gotten to the point that Jeff Francoeur is more productive striking out than making contact. If it were not for killing rallies and hitting into double plays he’d get no action at all. Last night’s double-play with the bases loaded was not even a surprise. As Gil said, it’s not Francoeur’s fault the Braves lost and it’s not Bobby’s fault that French can’t hit. However, Jeff has become the living, breathing metaphor for the entire team, with the exception of Chipper and Mac and our three starting pitchers ….. who are beginning to show their inevitable frustration for the lack of run support. The team looks listless when they take the field. They are a rudderless team. They looked as though they’d rather be somewhere else. Kelly is lost and confused. I’ve never seen this Atlanta team look so bad… ever. So, what is the problem? Who should take the blame for French taking the field every day? Who is to be blamed for the 250 “slugger” taking a pouting 2-day, truncated stint in Mississippi? Who should answer for 233 hitting (missing) Kelly Johnson being cemented into second base when Prado or someone else could fill the spot? Who takes the rap for Schafer struggling way too long before finally, appropriately, mercifully being sent back to the minors where he belongs this year? Who is responsible for using Peter Moylan until his TJ-recovering arm falls off? Who is responsible when the entire team goes into a funk and stays in that funk for two months? Who is ultimately responsible when a professional ball club appears listless, lost, confused and befuddled for so long? Who should be called on the carpet? Who will call those in responsible management positions onto the carpet? With Liberty and the current regime, there will be no response to this miserable, hapless play, other than the usual spin. For this Braves team, the GM, Cox and his buddies (otherwise known as coaches), there is no accountability for results outside of the accounting department and the dugout where some derrieres rest way too comfortably on their country club, media guarded, bullet-proof, faded and tattered laurels. Well, that is a strong sounding title for a new lead, blog, whathaveyou, isn’t it??? Yet, I do think anyone who reads here would defend TP both as a former player and as a man. He was a great player, the kind of player we need today – and I bet he will someday make a fine manager. But, as a hitting coach??? Not so much. He became the hitting coach in November of 2001. 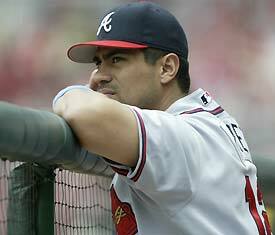 Next year, Javy Lopez hit .233, the lowest BA of his Braves career. In 2001, team B.A. was .260. In 2002, the team B.A shot all the way up to…. .260. In 2003, the team average did improve to .284.Marcus Giles, Chipper, Andruw and Garry Sheffield all hit above .300.
Credit to TP, God given skill, or a little help from steroids??? As I mentioned before, can anyone remember a hitter saying Terry really helped them??? Or even complimenting him in general??? Someone that wasn’t Bobby Cox??? It must have happened somewhere, but I sure don’t remember it…. Sports south ran that “David Justice in his own words” a few weeks ago…I guess I always caught the last part, but watched it from the beginning. It was interesting on several levels. One, to see Justice realize he made some mistakes, how he would do things differently now…wishes he knew then what he knows now…Also how hitting coach Clarence Jones told him basically that he could continue to hit 20 homers a year, or start hitting the ball the other way, and how he could hit 40 in a year, which he did in 1993. Again, the sort of thing I don’t hear mentioned with TP. Does he try to get Frenchy to not only hit the ball the other way, but with power??? Does he or the Batting practice guy throw him dozens of pitches outside to show him if it ain’t a strike, you CANNOT hit it??? He may…I don’t know. How often do you see him interviewed??? I may have missed it, but you would think a few times a year he would talk about his hitting philosophy, what he always wants guys to remember. In fact, I rarely see any coach ever interviewed! I saw McDowell the other day and it made me think how DOB had even said how he wasn’t a good interview, and after being such a character as a player, how disappointed he was in McDowell the serious coach of few words. Anyway, back to T.P. A recent article relayed the point of how hurt T.P. was with Frenchy seeking outside help with his hitting. Doesn’t that speak volumes???? Wouldn’t you think the greatest desire of a hitting coach would have, is to see a player be successful??? Especially one you had worked with all year and had no success with??? You can’t get inside someone else’s head, but I would wish the best to a player that I clearly hadn’t been able to help, and if another teacher came along(And TP has to know Rudy Jaramillo is considered the best hitting coach around) and helped him, I’d do my level best to find out what were the keys to the success, and help him stick with that plan. The Frenchy we saw in Spring training and the first week or so of the season, looked like a new man, a man with a plan..a man with a smooth swing. Now look at him. He has a strange, powerless swing. Stance is more closed up. Even the home run hit the other day looked like total luck, not a good swing at all. Friday night he worked the count full and couldn’t hit a 93 MPH pitch right down the middle. If he was 35, they would say his bat had slowed down. Does TP ever talk to him about percentages??? Me, I am just a nobody…a just a longtime fan of the game. But it’s plain as nose on your face that when a hitter has a weakness, word gets out, pitchers exploit those weaknesses. It’s not enough to say, don’t swing at balls out of the strike zone. Back that up with some stats. I bet TP could in 5 minutes find out how many pitches were strikes that Jeff gets with 2 strikes. As with Andruw the last few years, wouldn’t you think 80% of 2 strike pitches were outside??? Ok, one in 5 times you will look silly with the bat resting on your shoulder for strike 3, but the other 4 times, you will make the pitchers work. You might get a walk, or a pitch down the middle if the count goes from 1-2 to 3-2. Hasn’t TP ever watched a Yankees-Red Sox game??? Every time I see them play each other, or other teams in the league, you see guys down 0-2, or 1-2 end up getting walked. Then the next guy works a 3-2 count, and the pitcher, not wanting to walk back to back hitters, will grove a pitch that is a double or a homer. Even a dope like me can recognize patterns in the way the game is played today. What works best today. TP was a great player, a team leader. An agressive hitter that rarely walked. Probably not the best guy in the world to be a hitting coach. Like any hitter, he must have figured out some things he can pass on to hitters, but it sure doesn’t seem like enough to help those who can’t hit balls low and outside for a double…. After all this pounding on Terry Pendleton, hitting coach, I could still see him making a fine manager. His weaknesses as a hitting coach would be strengths with this team. It needs to be more aggressive on the base paths, to have more guys play with a chip on their shoulders….I think Terry wouldn’t coddle guys that were hitting .200, he’d bench them…. Meanwhile, Bobby is likely to manage the team for at least the next year or two, so I guess we will have Terry to kick around for awhile yet. So. What’s going on in baseball? I really like what I see. They are a ‘get ’em on, get ’em over, get ’em in’ type team – and I desperately hope Bobby will play them that way! Hitters got on base, Kotchman hits a 2-run double. Braves lead. Later, Prado hits a double, Escobar hits a sac fly, Prado scores. Braves win. Kawakami needs a little more acclimation time, I think, but I’d be surprised if he doesn’t wind up impressing us all. And speaking of impressing: Hanson. Oh, wow! I want to see him in the regular rotation, but I don’t want it to be too early. Is he really ready? Judging by the comments I read from players, I’d have to say ‘yes’. “Labeled by some as a poor man’s Greg Maddux, Medlen, who might actually look younger than Brent Lillibridge, possesses a fastball that rests between 91-93 mph and a changeup that has caught the attention of the Braves and many scouts from around the league. Medlen’s stock began to soar after he was placed in Double-A Mississippi’s starting rotation midway through the 2008 season. In the 92 1/3 innings he worked as a starter, Medlen recorded 90 strikeouts and issued 21 walks. Moylan & Co in the bullpen look good. Gonzo seems ready and eager to go. I can’t help but feel good about the pitching staff and the youngsters in the pipeline. I like the infield. Not spectacular, but more than adequate. Steady. And that can take you places instead of always having to wait for a flash in the sun. Combine steadiness with occasional flashes and we might be pleased with the result. I also think that Garret’s very presence in the outfield will have a positive effect on the other 2 outer positions. For once, ‘veteran presence’ actually means something! There are people who can inspire others to perform at a higher level and I get the impression that GA is one of them. ~Kawakami doesn’t speak English; I read that during games, his interpreter will not be allowed to accompany Bobby/whoever to the mound. Why?? ~The comment was made that Mac needs to be in ST instead of at the WBC so ‘he could learn Japanese.’ Ummm, why doesn’t Kawakami bother learn English if he’s going to play here?? ~Chino is still bench coach. Eddie Perez should be in that spot and Chino should be in the bullpen. OK – what do you think? With Presidents and other leaders and good Samaritans, circumstances usually make them what they are in the public record. The Civil War made Lincoln, as did that unfortunate theatre visit. The Great Depression, WWII, TVA and the promise of a “chicken in every pot” made FDR. The Panama Canal, the hostage crisis and that attacking rabid rabbit made Jimmy Carter. Well, maybe Carter isn’t such a good example, but you get the point… circumstance matters. Now, Braves. There is no doubt that Bobby Cox is a Hall of Fame manager. Bobby Cox managed most all of those titles under the fortunate circumstance of Glavine, Smoltz, Maddux and a host of good pitchers around them. That circumstance has changed (drastically). Now, on the games we play. Sports have changed too. Coaching in today’s pro sports arena is becoming pretty sophisticated stuff. Management requires learned skills, techniques, tactics and technology on top of mental sharpness and great experience in the game. In the old days of baseball managing, when things were simpler (just a few years ago), technology was a pencil or a piece of chalk. Managing a game was not nearly as statistically critical or access to information at our fingertips at the speed of technology as fundamental as it has become these days. Now, along with playing experience, the cost of entry for a manager should include being well versed in all of the tools to efficiently, effectively and successfully manage a modern sports team, including those without the highest payroll. If you can’t outspend’em you have to outsmart’em. Like it or not, over the next few years we’ll see more and more of the old-time managers, particularly those that aren’t particularly strategic and/or ‘new era’ coaches around them, as they become more and more ineffective. We have greater access to information than ever before. How we gather, interpret and act on that information will tell the tale. Change is inevitable. Those that don’t change are doomed to failure and irrelevance. Now, fishing. In the old days (also just a few years ago) a champion offshore sport or commercial fisherman relied on his experience and instinct to find fish and earn a living through years of trial and error. He relied on visually identifying weed-lines and bird activity. Every successful fisherman spent time logging time and tides, studying fish patterns and seasonal species, paying attention to wind direction and just applied good old common sense and dead reckoning. Today fishermen use modern GPS technology and satellite linked charts displaying real-time water temp, Ph, currents, wind direction, baitfish schools and such. They are also outfitted with the most amazing sonar and transducers that pipe detailed digital images in on color video monitors for tracking the exact conditions for species of fish they seek. Without all of the sophisticated technology and access to more maritime research and information than ever imagined, the old-style commercial fisherman simply cannot compete. Some folks that hold a glamorous view of the trade may pine for the ‘old salts’ and the good old days when things were simple, natural and not so complex… but come dinnertime we’d buy our fish from the guys that caught them. Now, jumping back to baseball again. MLB managers and an increasing number of coaches will have to master new methodologies and become fluent in emerging innovative technology, Sabermetrics, employ ever improving management software, digitally recorded and analyzed player profiles and so forth. For the health care (and increasing investment) of athletes, breakthrough medical research, surgical techniques, rehab and prevention will continue. Proactive procedures, vitamins and physical conditioning will be much more personalized to each unique athlete. Embracing and mastering these kinds of constantly improving ‘tools’ by managers and coaches is already critical and will only become more critical. The managers that don’t adapt will become painfully and glaringly evident. As with all sports and all business, the game of baseball will continue to evolve. The team that embraces change and strives to stay ahead of the tech and information curve will have a distinct competitive advantage in recruiting, coaching, maximizing talent and minimizing injury on the field, in the clubhouse, in the executive office and every other location and aspect of the franchise and the game itself… including one run wins. The old managers will go the way of the old fisherman. We’ll remember them with fondness, we’ll place them on a pedestal or induct them into the Hall of Fame or we’ll just pine for them when they’re gone. We’ll remember them in the context of ‘the good old days’, when life and the game of baseball was simpler. Let’s hope the good, old-time managers know when it’s time to go, especially if they are beginning to come back to the docks empty handed. If they don’t go gracefully when it’s their time, they may irreparably harm their own legacy, taint our fond memories of successes they’ve enjoyed and instead, write an unsuccessful, annoying and sad final chapter to an otherwise arguably brilliant career. We want to smile and cheer for a job well done when our ‘skippers’ walk or sail off into the sunset, not cringe, feel embarrassment, annoyance or frustration when they stay too long. We certainly don’t want to watch the boat take on water because of a skippers waning ability to see the cracks in the hull, flounder because of their lack of self awareness or sink because of their stubborn refusal to moor the boat when it’s time. For the good of the boat and the crew, Skippers have to know when to turn over the wheel in a storm. It’s too late for Bobby Cox to leave while the Braves are on top. It may be too late for him to leave on top of his own game. Let’s hope it doesn’t get embarrassing for the old skipper with the sea change going on around him in Major League Baseball. He’s been with the Braves since 1977. Bob Dider signed him after he graduated from the University of New Orleans as a non-drafted free agent to fill out a spot on the Kingsport roster. Fours years later, after he had wrested the last possible drop out of his playing career, then-farm director Hank Aaron made a job offer. Brian Snitker. Born 1955 in Illinois. He didn’t have an easy time of it either. Never made it to the majors, but has made the best of his talents and abilities as player, roving instructor, coach and manager in the Braves system for more than 30 years. He coached, taught and managed for 20+ seasons in the minors, leading clubs from the rookie leagues to AA in Anderson, Sumter, Durham, Macon, Danville, Myrtle Beach, Greenville, and Mississippi before he was named manager of the Richmond Braves in 2006. He said he never really developed a “style” of managing because a minor league manager never gets to pick his team; he just works with what he has. And he did pretty well at managing the rookies and kids: 1,140-1,145 (.499). Five of his clubs advanced into post-season play and he won 2 championships (back-to-back titles with Myrtle Beach in 1999 and 2000) and 3 Minor League Manager of the Year awards – 1997, 1999, 2000. He was managing the Mississippi Braves in Pearl in ’05 (Francoeur, McCann, Boyer, McBride, Lerew, James, et al) when an unprecedented 11 “Baby Braves” were called up to Atlanta. Still, Snitker led Mississippi to a 64-68 record in its first year, quite an accomplishment considering that they had just moved to a new city, most of the team’s stars were promoted to fill needs in Atlanta, and the last 8 games of the season were canceled due to Hurricane Katrina. Mel Roberts, once Brian’s hitting/first base coach who has known him since the ’80s, said Snitker’s main strength is his communication skills. After serving as Atlanta’s bullpen coach for parts of 3 seasons, he returned to the Minors in 1991. 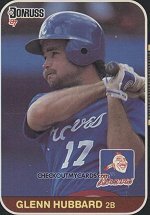 He didn’t know if he’d ever make it back the the Majors despite having accumulated 1,140 managerial victories with 9 different teams from Rookie level through AAA. After what amounted to a 16-year baseball road trip through the Minors, the 31-year Braves lifer is a full-time resident of suburban Atlanta again and no longer a far-away father. When Snitker told his wife Ronnie last fall that he’d be home (in Lilburn, GA) the next year, she said, “What?? Were you fired? Nope, Fredi Gonzalez went to Florida and Brian Snitker was back in the Majors again as 3rd base coach for Atlanta. “He’s had to miss a lot and I know that was difficult for him,” Ronnie said. “It isn’t easy to balance baseball and family, especially in the Minors. Snitker always seemed to have a great relationship with his players and he’s said to be a great communicator. He’s coached or managed all the young players now in Atlanta – and, from what I’ve read, it seems to be accepted that one day he will manage in the Major Leagues. Along with Terry Pendelton, Brian was considered by the Royals for their manager’s position. Bobby’s successor?? It’s just my opinion, but I wonder if he wouldn’t better serve the Braves, Bobby in particular, as bench coach instead of Chino. Chino has managed but his strengths seem to be more in coaching, while Brian is clearly the better manager. That’s just my take on it. Brian Snitker. He’s been there, done that, and got all the T-shirts. Got to respect those long, long years in the Minors, his perserverance and just plain old doggedness, as well as doing a really good job. Respect for a good guy. Listed as 5’7″, Glenn Dee Hubbard was born in 1957 at Hahn AFB, West Germany, is married and has three sons. Through 10 years with the Braves and 2 with the A’s, Glenn was better known for his fielding than his hitting, though he was an excellent bunter who led the National League in sacrifice outs in 1982. A steady glove and his willingness to stand his ground while turning a double play, even with a runner coming at him full tilt, made him a valuable asset. A check of the records indicates that he holds the Braves’ fielding records for second basemen in all categories. In 1981 he set a then Atlanta Braves’ record for second basemen with a .991 fielding percentage, but his most successful year was in 1983, when he hit .263, set career highs with 12 home runs and 70 RBI and was also named to the National League All-Star team. He led all NL second basemen in double plays in 1982, 1985 and 1987. Post-Season play: 1982 NLCS, 1983 All-Star, 1988 World Series (A’s). – committed only 127 errors in 12 years – or about 10 a year; that’s .06 per game. Or, just for fun, that’s 0.01 over the 11,206 innings he played. 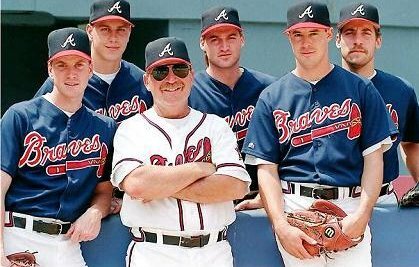 Before joining the Braves major league staff in 1999, Glenn spent the previous nine years coaching in the Braves’ minor leagues: Bradenton [’90], Macon [’91-’92, ’94, ’98] and Richmond. Throughout the offseason, when they were targeting Kelly Johnson to serve as their starting second baseman, the Braves possessed a confidence that was created by the remarkable work Glenn Hubbard had done with Marcus Giles. As Braves general manager John Schuerholz remembers, there was a time when “Marcus couldn’t catch a cold.” But Hubbard worked diligently with Giles at Class A Macon in 1999, and by the time the 2003 season ended, the young second baseman had become a Major League All-Star with Gold Glove potential. “I think if Hubby can turn me into an average second baseman, compared to where I was in the Minors, he could probably turn you guys (in the media) into a pretty good second baseman,” Giles said as he and his Padres teammates prepared for Monday night’s series opener against the Braves at Turner Field. Johnson is certainly a better athlete than the media members that Giles was speaking to on Monday. But he had never previously played second base and thus it has been remarkable to see him evolve into a dependable defender, who has committed just one error in his first 141 chances of the year. “Kelly Johnson has been brilliant there,” said Braves manager Bobby Cox, who last week said his new second baseman was playing the position as well as Hall of Famer Bill Mazeroski once did. Having seen what Hubbard, who was a sure-handed second baseman in Atlanta from 1978-87, has done with both Giles and Johnson, Cox thinks it’s time people realize the importance of his current first-base coach. Because Giles’ cost was beginning to surpass the offensive value he was providing, the Braves opted to not re-sign him after last season. He says that he understands it was a business decision that has given him the opportunity to play in his hometown of San Diego and with his older brother, Brian, who is a Padres outfielder. Glenn Hubbard trotted on the field Wednesday wearing a helmet — and feeling downright ridiculous. Hubbard pointed toward a young batboy standing at the edge of the Braves dugout, his head dutifully covered by a helmet. Hobbit or not, helmet or not, Glenn Hubbard is a good man to have in your corner: unpretentious, hardworking, down-to-earth, steady. Somebody you can respect. Continuing the thought – who are these guys we see on the field and in the dugout, anyway? Born in Havana, Cuba on November 22, 1957 so he’s coming up on age 51. His playing info says “Hits right, Throws right, 6’0″ and 245 lbs” – that may have changed… 🙂 Attended and was signed out of Miami-Dade New World Center Community College. Lives in Peachtree City with wife Lynn and daughter Lauren. Chino was drafted in the first round of the Jan 1977 amateur draft by the Phillies. Played seven years in the minors, started out mostly as a first baseman, but by his 2nd year was an All-Star catcher – despite a Appalachian League-leading 17 passed balls. He spent some time in the Twins chain and was the California League All-Star backup – even with 19 errors. Cadahia came to the Braves in 1996 after serving in the Texas Rangers organization for 12 years as a pitching coach and manager in their minor league system. He began his coaching career as a pitching coach at Salem of the Carolina League from 1984 through 1985. The following year he managed Daytona Beach of the Florida State League, and in 1987 he managed at Gastonia of the South Atlantic League. From 1988 through 1995, Cadahia managed the Rangers Gulf Coast League rookie squad in Port Charlotte, Florida. Giving Rodriguez his famous nickname isn’t the only influence Cadahia had on the 13-time All Star’s career. When Rodriguez signed with Texas in the summer of 1988, he was sent to the Gulf Coast League, where Cadahia was managing a team in Port Charlotte, Fla. Cadahia showed Rodriguez the ropes, on and off the field. Besides learning the game on a professional level, Rodriguez had to learn a new language after coming to the Rangers from Puerto Rico. Cadahia, who is Cuban, helped him with that. Cadahia also showed Rodriguez how to adapt to life on his own, giving tips on typical household chores. The number of coaches used by big league teams has evolved over the years. Base coaches often double up as infield, outfield, and base-running instructors. There is also the pitching coach, hitting coach, and bullpen coach, who often oversees the catchers, too. And now you have the bench coach, which usually can be divided among those whose decades of experience – often as former managers – make them invaluable, and those who are managers-in-training. Joe Torre believes the first bench coach was longtime manager Don Zimmer, who for a decade sat Yoda-like next to Torre on the Yankees bench. “It started with me and Zim,” Torre said. “(Red) Schoendienst was the closest I had in St. Louis. He’d come up to me and remind me of something from time to time. When I sat with Zim, he sort of brought me along. I was a little bit more on the conservative side and he was more on the aggressive side. We met somewhere in the middle. BA: Whenever anyone mentions the Braves, the first thing they talk about is developing pitching. But, like we all started to notice with the emergence of Brian McCann and the development of Jarrod Saltalamacchia, you guys develop catchers too. DM: We’ve got a great catching instructor here who’s also our field coordinator in Chino Cadahia. He does a tremendous job and has been working with catchers since he worked with Pudge Rodriguez when he was coming through the Texas organization. Somehow I’ve lost the link to the next quote so I apologize to the original source while I continue looking for it. Q: When the Braves win, do you experience a particular kind of satisfaction as a bench coach who prepares these guys every day? CHINO: Having had a lot of these kids in the minor leagues, and to see where they are and to see them play in this environment in front of 30-, 40-, 50,000 people and get it done, you know, it’s a big satisfaction. You feel like you had a little bit to do with that, you know, and not just me personally, but – what’s the word I’m looking for – the whole program in the minor leagues, you know, all the steps that they took, and the instructional leagues, the spring trainings, you know, all the things we’ve done with them. We’ve got them not only physically but mentally ready to be able to do this, so you feel like a part of it. In general we’ve (Atlanta’s organization) been very successful doing that with young kids. We take a lot of pride in doing it. A lot of organizations try to do it the way we do it, or, you know, try and copy our system or whatever and, you know, pretty much its black-and-white, but it’s the people that make it happen: the scouts, the coaches, the managers, the instructors, the front-office people, that’s what makes it happen. And then the end result, you know, you see Brian McCann and Kelly Johnson and Jeff Francoeur and Chucky James and Yunel Escobar and all the young guys that have played here, you know, get it done on this level, it gives you an awful lot of satisfaction to see them, you know, perform at this level. Every once in a while they’ll talk about stuff they did in Rome, Ga. (where the minor-league Rome Braves play), or in an instructional league, because it takes a lot for them to be able to perform at this level, even as talented as they are. It’s a lot of sacrifice. Q: And to get where you are today, you had to go through a lot of the same kinds of things. CHINO: Yeah, coaches are the same way. Brian [Snitker] was a coach up here in the ’80s; it took him 20-some years to get back up to the big leagues, you know, every coach. When I started coaching, this is what I wanted to do, I wanted to be a Major League coach. If I would have known it was going to take 24 years, I might have gone to another profession, but not really. Q: Is the feeling you have now just utter contentment? CHINO: No, I think, believe it or not, it’s just the satisfaction. Once I got into it, and you put both feet into it, you know, you feel like a part of something special. I never looked at it like, jeez, I’m on my 20th year now, or I’m on my 21st year or my 19th year, you know, I just did whatever my job was as good as I could do it, hoping that one day the opportunity will come up. For some guys, it’ll take 24 years (to make it to the Majors), for most of the guys it never happens. So you know, you got to weigh both of them. There are five or six coaches for each team, you know, that’s 180 jobs. You’re looking to be one of 180, so, you know, percentages are not with you a lot of the time. You just hope that you make a difference in the minor leagues and you help a lot of young players and you do your work, your job, and you do it real good and somebody notices. A lot of this is timing also. It’s just like anything else, you know, you gotta pay your dues, you gotta be a good guy, you gotta be able to do your work and your job and people have to respect you for that, and I’ve always taken a lot of pride, personally doing my job. And I’m surrounded by people that are, you know – I’ve had real good role models to follow. It’s a good combination, as far as that’s concerned. Look closely at the cart! Chino. We poke fun at him (probably too often) but he obviously has experience though somehow I just don’t see him being a ML manager. What do you think? We see them on the field, we know their names, we talk about what they do or don’t do, but what do we really know about them? The coaches? In a ten-year career, he was a .253 hitter with 40 home runs and 172 RBI in 564 games. His post-season credits include: 1996 NLCS, 1996 World Series, 1996 NL Div Series, 1997 NLCS, 1997 NL Div Series, 1998 NL Div Series, 1998 NLCS, 1999 NL Div Series, 1999 NLCS, 1999 World Series, 2004 NL Div Series , and was the 1999 NL NLCS MVP. He made his MLB debut in Sep 1995, the same year as Ray Durham, Johnny Damon, Edgardo Alfonzo, Derik Jeter, Jason Giambi, Billy Wagner and Mariano Rivera. Eduardo Rafael Pérez was born May 4, 1968 in Venezuela. Braves backup catcher Eddie Perez has been reduced to a plodding, slump-shouldered, knock-kneed M*A*S*H* unit. Name a body part, and the battered and bruised Perez has injured it in some way, shape or form. His shoulders, biceps, thighs and ribs have been tattooed with large, round, black and purple hematomas, the result of being the human backstop for hundreds of foul tips. His jaw, now chronically arthritic, snaps, crackles and pops every time he speaks or chews, thanks to all those 90-mph fastballs that have ricocheted into his catcher’s mask. His left index finger constantly swells and throbs, a 24-hour reminder of pitch after pitch having slammed into his mitt. And a broken blood vessel in the middle finger on his left hand kept him out of Sunday’s World Series Game 2. His knees are riddled with painful tendinitis, and let’s not forget those spike wounds, or that stunning concussion. Mental and physical toughness, the patience of a saint and the dutiful prayers of his beloved family have carried Perez to the top of the baseball world this season. It was only two weeks ago that the 31-year-old from Cuidad Ojeda, Venezuela, vaulted himself into America’s consciousness in the National League Championship Series. He hit .500 against the Mets and was named the NLCS Most Valuable Player. The second youngest of Salvador and Lila Perez’s six sons, Eddie grew up in the oil-rich region of eastern Venezuela. His father, recently retired, worked for 50 years in one of the local oil refineries. When he was 7 years old, Eddie learned to play baseball from Salvador, a longtime catcher for several of the great local amateur club teams. The following year, inspired by his father’s passion for the position, Eddie, now 8, moved to catcher. In September 1986, right before Perez was to graduate from high school, Pedro Gonzalez, a Braves scout and longtime coach in the Dominican Republic, plucked him out of a crowd of 62 players at a local tryout. Perez signed a $15,000 free-agent contract with the Braves and a $5,000 pact with the Venezuelan Winter League’s Aragua Tigres, which were managed by countryman Davey Concepcion. I was rich,” Perez says. For the next nine years, Perez languished in the minors, playing winter ball in Venezuela to make up for all the time he spent on the bench, right up through this past offseason. Tragedy struck in 1993. While sliding into home plate against Class AA Huntsville (Ala.) on May 23, Perez dislocated his tailbone. He flew home to Venezuela to recuperate and did not return to the team until Aug. 27. “The first day I got back, one of the coaches told me to get dressed, that I was taking batting practice,” Perez says. “It was raining, and he thought it would be a good chance to practice sliding. I was panicked. Well, until he fought back from the emotional devastation of having been dissuaded by coaches from going to Venezuela for the birth of daughter Maried . Until he was named the MVP of the Venezuelan Winter League in ’94. Until he was called up to the Braves on Aug. 30, 1995. And until he was named NLCS MVP last week. “That’s the biggest thing to ever happen to me,” Perez says. The new two-story Duluth, Ga., home he and wife Marisol, his childhood sweetheart, share with their two children, Maried, now 5 1/2, and Andres Eduardo, 17 months, is filled with bouquets of flowers from friends and Braves fans. Salavador and Lila, who have been visiting Atlanta since late September, are caught up in the whirlwind of the postseason. Marcos and Jolanda Nava, Marisol’s parents, came along, too. This is the first time Salvador and Lila have been able to attend Eddie’s games together since their son signed with the Braves back in ’87. “This is too much, too exciting,” says Salvador, with Eddie translating. And so does their son. His tears come from a much deeper place than the delight of having won the MVP trophy and playing for the Braves in the World Series. The tears mean Perez finally has made it in America. Yes, Lopez will return as the Braves’ No. 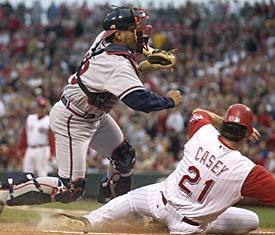 1 catcher in 2000, healed from the knee injury that sidelined him in July for the balance of the 1999 season. But no, Perez does not qualify as a nobody. 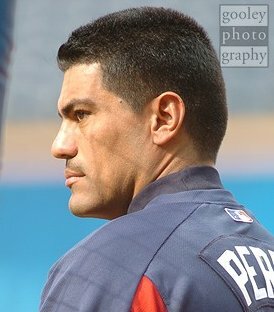 Perez, best known as Greg Maddux’s catcher and an able fill-in for Lopez since becoming a full-time member of the Braves in 1996, has added to his resume the past 2 1/2 weeks. Against the Mets in the NLCS, Perez went 10-for-20 and hit two home runs, the second a game-winning shot in Game 2. Perez, a native of Venezuela, hit .500 in the thrill-a-minute series, with the rest of the Atlanta offense batting a composite .194. True, Perez hasn’t exactly been a hitting machine in his four full seasons in the majors–as his career average of .259 attests–but he has made significant contributions. In 1998, he batted .336 in 61 games, and his grand slam in the division series assured Atlanta a place in the NLCS. This season, he hit .266 after the All-Star break. Manager Bobby Cox, understandably, is high on Perez. Perez, a late-season call-up four years ago after spending nine seasons in the minor leagues, was in the lineup for Game 1 of the 1999 World Series but didn’t start Game 2. “I’m a backup,” maintains Perez, whose humility and disarming smile make him a favorite with Braves fans. “But I have to be ready because we don’t have Javy (a close friend). My main thing is catching. I try to take at-bats as they come. The major leagues also had its share of comedy. Take the fight I was in with the Atlanta Braves, when I was a member of the Philadelphia Phillies. Over the course of a week, my teammate Paul Byrd, a pitcher, had unintentionally hit Braves catcher Eddie Perez not once but twice in the back. Perez and Byrd had once been teammates (and Bible study partners), but Perez had apparently left forgiveness at the door. When Byrd stepped up to the plate for his next at-bat, Perez hit him and then jumped him. Since I was on-deck and the closest player to the fray, I ran over to pry them apart. The next thing I knew, I was at the bottom of a pile of players, my legs trapped, spikes barely missing my various body parts. The Braves’ Ozzie Guillen evidently decided that the best way to get out of the pile was to pull me out by the head. I had a stiff neck for three days. What I found interesting was that instead of Perez and Byrd ripping each other’s hair out, they were locked together in a protective embrace, apologizing and praying to get out of this mass of humanity. Everyone within earshot was wondering why we all risked physical harm for a séance. To add injury to absurdity, when our bullpen coach came running in from left field to join the fight, he pulled a hamstring halfway to the pile. Just my opinion, but I think he’s a pretty neat person and I’m glad I know a little more about who is really is. Hope you enjoy it, too!